Mercedes "MJ" Javid is officially a mom! The Shahs of Sunset star and husband Tommy Feight welcomed a baby boy! MJ's rep confirms exclusively to E! News that Shams Francis Feight was born 6lbs 9oz in Los Angeles early Wednesday morning via a C-section. The Bravo star "feels eternally grateful and blessed" after welcoming her son. The name Shams is in honor of MJ's dad who passed and Francis is in honor of Tommy's mom who passed. Her rep adds, "The healthy baby boy is happy and doing great, and the family can't wait to bring him home." 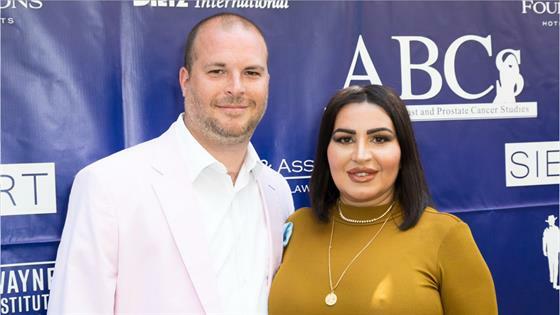 Today's big announcement is happy news for loyal Shahs of Sunset fans who have watched the reality star document her journey to parenthood online and on Bravo. MJ elected to undergo in vitro fertilization (IVF) in hopes of expanding her family with Tommy. In addition, she had multiple surgeries to remove uterine polyps in preparation for an embryo transfer. "Feeling overwhelmed with excitement, gratefulness, and hopeful about what lies ahead," MJ previously shared on Instagram following a previous hospital visit. "My husband and I are very grateful and hopeful and appreciative of this journey and what is to come. We wouldn't have made it this far without my doctors. My favorite thing throughout this journey is going to the doctor to see the baby on the ultrasound." Throughout her pregnancy, the realtor would update fans on how she was feeling. And whether documenting her cravings for raw fruit and veggies to her pregnancy fashion, the 46-year-old kept fans in the know with her journey. Perhaps it shouldn't be the biggest surprise for someone who has allowed her life to be documented on Bravo for seven seasons. "I always imagined that pregnancy, being the first leg of the journey to motherhood would bring about positive & permanent changes and adjustments into my life. We have an innocent person to set an example for, and be our best for," MJ wrote in an Instagram post. "This inspires and excites me. Bedrest has given me a different outlook, which I hope to work very hard to carry out into my future." As MJ begins this new chapter of her life, the Bravo star is hopeful that she helped expand the conversation about IVF. She's also grateful for Dr. Shahin GhadirI, her co-stars and fans for all their support and encouragement. "I look forward to keeping the conversation going," she shared with her followers. Congratulations MJ on your happy family.